Your T-shirt has always doubled as your personal billboard, but why settle for a single, static statement every time you pull one on? 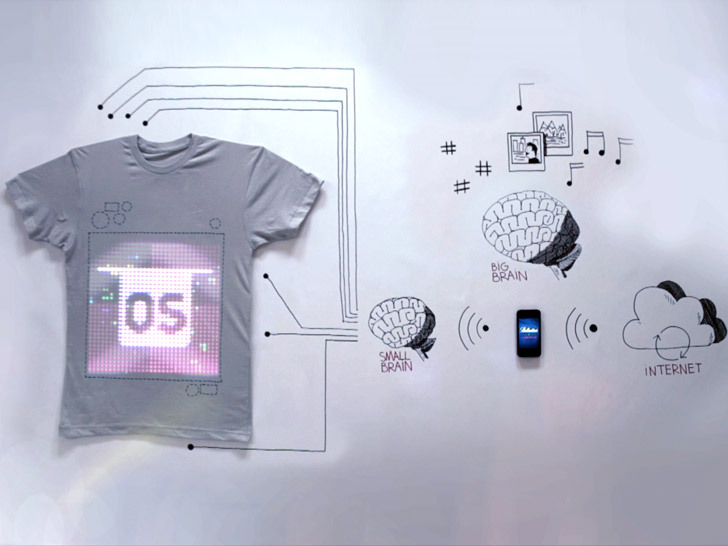 Leave it to the wizards at CuteCircuit to pioneer the world’s first programmable T-shirt. An unlikely collaboration with Ballantine’s, a producer of blended Scotch whisky, “TshirtOS” allows you to display virtually anything you want, whether it’s your Facebook status, Mindy Kaling’s latest tweet, a screed on global warming, or a rotating picture gallery featuring Maru the cat. Hailed by its makers as the “world’s most advanced piece of digital clothing,” TshirtOS consists of 1,024 LEDs arranged in a 32-by-32 grid, 32 microprocessors, and a Bluetooth connection that turns any smartphone into a turnkey broadcaster. But flashing pictograms isn’t all the garment does. The 100 percent cotton tee also includes a built-in micro-camera, a microphone, an accelerometer, and speakers to capture and exhibit photos or videos on the fly. TshirtOS also includes a micro-camera, microphone, and speakers to capture and exhibit photos or videos on the fly. Although TshirtOS is still in the prototype stage, CuteCircuit and Ballantine’s are registering interest from potential buyers. CuteCircuit isn’t a stranger to firsts, either. In 2009, the London-based atelier unveiled the world’s largest wearable display: a flashing gown composed of 24,000 full-color LEDs. Your T-shirt has always doubled as your personal billboard, but why settle for a single, static statement every time you pull one on? Leave it to the wizards at CuteCircuit to pioneer the world's first programmable T-shirt. An unlikely collaboration with Ballantine�s, a producer of blended Scotch whisky, "TshirtOS" allows you to display virtually anything you want, whether it's your Facebook status, Mindy Kaling's latest tweet, a screed on global warming, or a rotating picture gallery featuring Maru the cat.